Will we be powering on a Steam Machine this time next year? Valve unveiled its play for the living room last week, and it's far more than a mere living room PC we initially imagined. The strategy is three-pronged: with SteamOS, Steam Machines (including Valve's own Steam Box), and that weird Steam Controller, Valve hopes to make Linux PC gaming mainstream. But that's not going to be an easy battle to win, and Valve needs to get support from as many developers as it can. Which raises an important question: What do game developers think of the new Steam products? GamesIndustry International answered that question today with a report in which it interviewed with multiple game developers, big and small. Gearbox Software CEO and President Randy Pitchford had the most to say, and he sounds skeptical. "There is always a chicken-and-egg problem here and the last time Valve was able to motivate us to wade into a new paradigm, they attracted us there with a product - I was forced to install and use Steam in order to play Half-Life 2," Pitchford told the site. He suggested Half-Life 3 could be a good incentive, a sentiment we share. "Ultimately, without that must-buy product driving us all towards this stuff, I expect that the industry at large will watch curiously, but remain largely unaffected by anything Steam does along this vector of OS, machines and controllers over the next two or three years," Pitchford continued, adding that execs at Microsoft and Sony likely aren't too worried. Some developers were more optimistic. Paradox Interactive CEO Fredrik Wester said SteamOS and Steam Machines' success will depend on "how open the system will be and how big the install base becomes," and expressed hope that its openness might in turn force console makers to make their systems more open. Dejobaan Games President Ichiro Lambe agreed that Valve's potential success could help force Microsoft and Sony to change certain policies, being beneficial for gamers in the long run. Lambe also applauded Valve for pushing past certain barriers and being easy to work with. "I can't overstate how important all this is: I'm able develop for SteamOS with minimal risk. The upside is that I might reach millions of new gamers. This makes the platform really attractive," he said. And Tripwire Interactive Vice President Alan Wilson thanked Valve for providing gamers with more choices and for making aspects like the innovative Steam controller optional. Will SteamOS revolutionize living room and/or PC gaming, or will it be another Ouya: lots of hype but lame in practice? 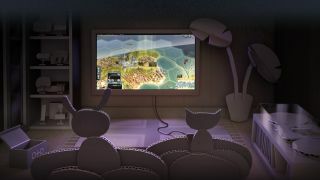 Valve's come a long way, and it's got a long way to go - but can SteamOS help it conquer living rooms in 10 easy steps?